Since its inception in 1994, The National Lottery has given away over £65 Billion in prizes, and also made 4,750 individuals millionaires. The National Lottery’s main purpose of coming into being is to change lives and they have identified that this can’t be done without public support. That’s why they have received overwhelming support from the young and elderly in the UK since their inception. The National Lottery for the people that uses its platforms supports 400 new projects in the UK every week. On the average, £30 million is raised weekly. That’s an average of 185 projects per postcode area with over £37 Billion invested in the UK by 12 specialist organizations. 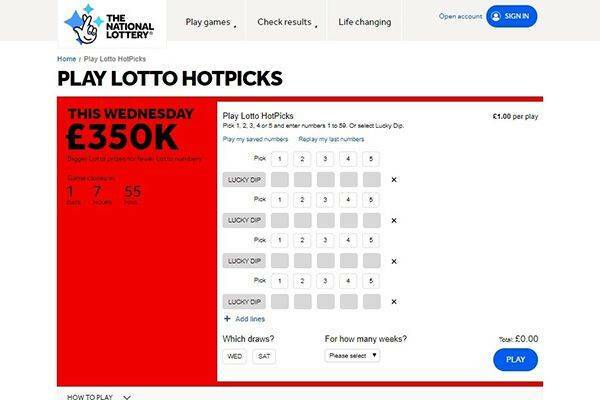 With overwhelming daily visits, the National Lottery offers 5 game varieties to a plethora of users. The available lotteries are Lotto, Euro Millions, Thunder Ball, Lotto Hotpicks, and Euro Millions Hotpicks. The popular games are £4 Million Jackpot, £20 Million Cash Spectacular, Frosty Bingo, and Monopoly Gold, 20 x Cash Multiplier, Monopoly Winning Lines, Keep Your Cash, £250,000 Pounds Now, Instant Lotto Bonus, and Instant Millionaire Lifestyle. While familiar games are Monopoly Millionaire, Cashword VIP, Lucky Lines, Snakes & Ladders, £100,000 Jackpot, £250,000 Jackpot, Jewel Millionaire, Cash Champions, Jewel Smash, and Snakes & Ladders Jungle. Also, National Lotto offers instant scratch and win games to users. With its special motto “there’s strength in numbers”, The National Lottery offers users the opportunity to play alongside friends, family or colleagues. Syndicates can choose from an array of 5 game sets on offering for their exclusive gameplay. The goal behind the creation of the site’s software was to ensure that users can access the site with relative ease, thus fostering the credibility rating from Accessibility Net. The National Lottery offers a huge £5.2 Million Jackpot plus one guaranteed raffle millionaire every Saturday. To have a view of the totality of games on offer, you can proceed to the Gamestore and access all games feature embedded within. The site’s user interface is very easy to navigate. Users can select from an array of games outlined in unique color coding. If you are familiar with the gameplay, you need not look at the names of the games; rather you can choose the game you want to play just by looking at the color coding. The site was also built with the consideration of user diversity, creating an option for people with another language to be able to access the site seamlessly. The games are designed to be played with Animation. Users utilizing screen reader need to deactivate the Flash or HTML animation to be able to access the gameplay screen. 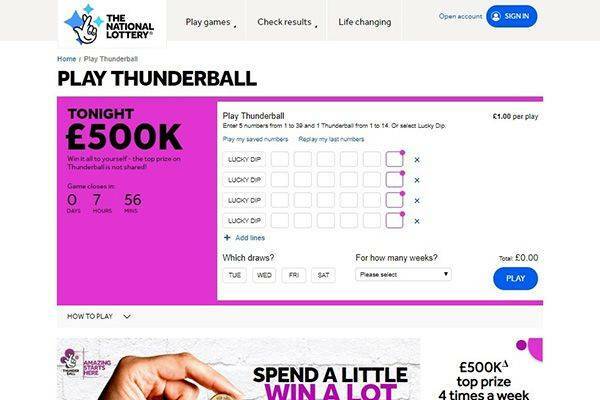 The National Lottery has a provision for mobile users to access the site seamlessly. Users can download the app from the IOS and Android Play Stores. The app can be used to check winning numbers, monitor the progress of staked games, acquire information on jackpot amounts, and also scan scratch and win tickets. The Mobile application is highly interactive and allows you to purchase tickets for the 5 main game varieties. 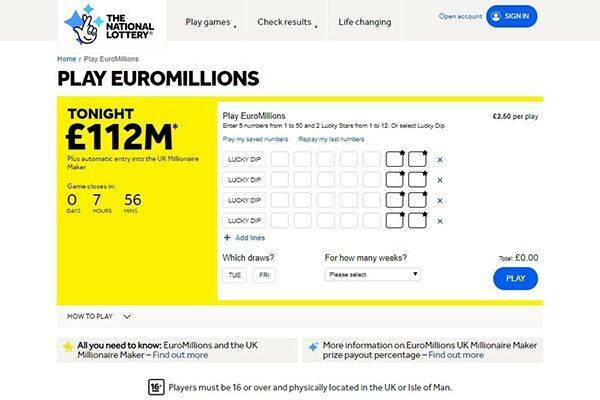 The National Lottery doesn’t offer any discounts however, it runs a Euro Millions Event open to UK Users. 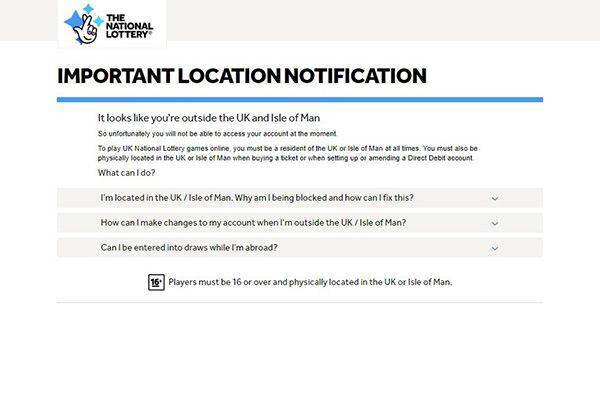 The National Lottery is open to users in the UK and Isle of Man. The site allows for Debit cards registered only in the UK and Isle of Man to be used for opening an account on the site. Individuals with a pre-existing active account are exempted from opening another account while the former is still active. Users can also buy entries with their Pingit account. Prize winnings above £50,000 can only be claimed after contacting customer support. Claims can only be collected in person. FAQ? 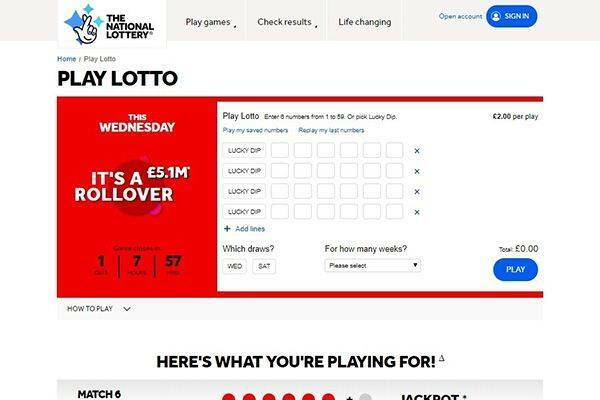 Yes, National Lottery has a dedicated help page that provides answers to questions about how to claim prizes, how to buy tickets, how to check tickets, how to change debit cards, and a host of others. National Lottery can be contacted by post, all you need to do is to click the By Post Button provided on the Contact Us Field and get the required information. Web online chat is unavailable, and missed as became the norm. IS THE NATIONAL LOTTERY (UK) LEGIT? The site has been in operation for 24 years and adheres to stringent security guidelines. Its security standards have been fully certified to ISO27001:2013 and PCI-DSS. A few disputes have been made over the site’s ability to balance its earning and money it pays out to gamers. 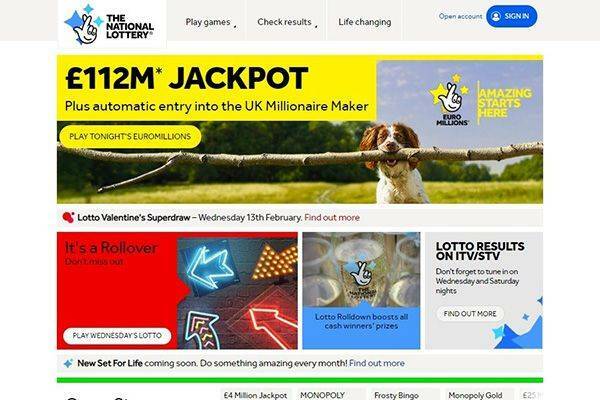 A few disgruntled gamers have given the site a 1-star rating claiming that owners of The National Lottery Camelot have lost its impetus. However, these claims can be narrowed down to player insecurities. On a scale of 1 to 5, we rate The National Lottery 3.5. The National Lottery has been running for over two decades now, and its corporate social responsibility of giving back to the community makes it one of the leading Lottery franchise in Europe. Its ISO certification makes it a secure platform for gamers to utilize with little risk of losing their personal data to numerous third parties. The National Lottery comes highly recommend since it has been existence for 24 years, new users can comfortably access the site and make their stakes.